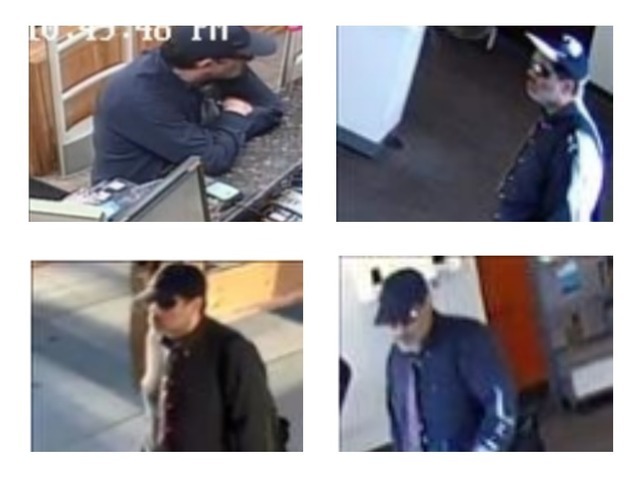 At 2:00 pm on Jan. 22, a man entered a bank at the 8700 block of West Sahara Avenue. The man approached a teller and presented a robbery note, demanding money from the business. The teller then gave the man an undisclosed amount of money. The man took the money and left the bank. No injuries were reported. The man is described as a black male, in his 30's, 5 feet 8 inches to 5 feet 9 inches, medium build, wearing a black hat, grey hooded sweatshirt, blue jeans, and prescription glasses. Police are looking for a man who has committed a number of robberies to several businesses in the Las Vegas valley beginning in around May of 2016, before picking up again around December of 2017. He is described as 5'9" to 6' tall, approximately 160-200 pounds, possible scarring on face, well trimmed salt & pepper beard and mustache, well dressed and 30-45 years of age.